For me, cooking is lots of fun, but the prep work? Not so much. Slicing, dicing and chopping can be time consuming- not to mention tiring. Plus, no matter how hard you try, I mean, I try, I can’t chop like a pro- I can hear those pretty, perfectly diced vegetables on the Food Network laughing at me. Well, now it’s my turn (yours too), to have the last laugh, because there is a way to make prepping and presenting quicker, easier, and a whole lot prettier: an electric knife. These knives allow for great control and precision, all while cutting down (literally) on effort, for a smooth experience. My Best Electric Knife review and buying guide will help you understand what these knives can do and help you choose the one that is right for you. Trust me, these gadgets will transform how you cook- and have family and friends swearing Bobby Flay is in your kitchen. The Best Electric Knife Comparison: Which one is the best? 1 The Best Electric Knife Comparison: Which one is the best? Now it’s time for the fun part: reviewing the best electric knives on the market. Each of these models has something different to offer, but they all are top quality and come at different price points to work with any budget. Of all the models on this list, the CEK-40 from Cuisinart is the best option, thanks to multiple blade options and a superior quality design that takes convenience to a whole new level. This plug-in style knife has everything you can think of, starting with quality stainless-steel blades for precision chopping, dicing and slicing. 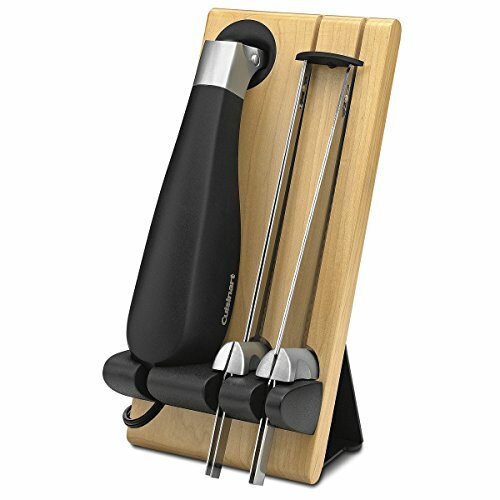 There is a carving blade and a bread blade, so you can quickly slice French bread or filet a fish without mixing flavors or tearing delicate meats. There is also an ergonomic handle that gives you a stable, comfortable grip, and a solid wooden chopping block to hold the knife and blades, for easy and safe storage. Speaking of safe, there is a safety lock to keep it off when not in use, plus, the blades pop on and off easily and there is an on/off button for quick start and stop: it won’t automatically start when plugged in. A do-it-all model that is great for those who cook often and for a lot of people. This model is definitely the best value for your money, with a high-powered blade that cuts through bread, bone and more for under $15. The blades are also stainless-steel and dishwasher safe, so maintenance and care is simpler than ever. In addition to the strong blades, this model has an extra-long cord for no-tangles and a non-slip, contoured plastic handle that fits in any size hand. There is a safety lock so it won’t accidentally start and there is a carving fork included so you can hold your bread or meat easily while cutting. A bargain price for a durable blade that makes this a great value in any kitchen. If you have a true passion for cooking or love to cook outdoors then this knife from Rapala might be the one for you. At right around $100 it is a bit pricier than the others, but more than worth it thanks to its increased function. This cordless model has a charging base and red indicator light for simple and quick charging indoors or out. Charge time is under 4 hours, making it faster than standard models and no cord means you can use it in your kitchen, yard, or on a camping trip. The filet blade, so you can gut and clean fish or poultry, as well as slice them. The blade lets you de-bone fish adeptly and easily, as well as small game, so you can cook anything anywhere. Plus, there is a case to keep and carry it, along with 2 rechargeable batteries, so you are always ready to go. This is important if you plan to use it on trips or cookouts. Great for travelers and outdoor lovers. For cooks who want to control the size of every cut, this knife from Hamilton Beach is a good choice. Featuring 2 stainless-steel blades that rotate in opposite directions, it gives you cuts that are the exact same size each and every time you cut. Identical cuts are important, as they help you when creating complicated dishes, or if you cook for young kids or the elderly. The blade pops out, for easy cleaning too. 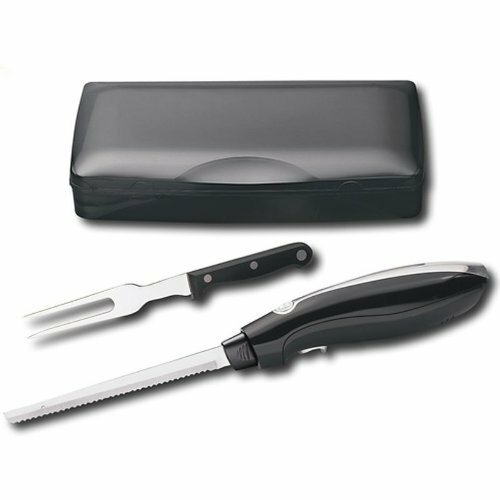 In addition, this plug-in knife also has a smooth handle shaped to fit into the palm of your hand, and 2 great extras: a carving fork and carry case for storage. Carving forks make it easier to pick up sliced pieces and also gives you a smart way to hold food while slicing, so it doesn’t slip or move. Good for cooks who have special needs or create lots of layered recipes. This electric knife will save you money and space, making it a good investment for those on a budget. Theserrated stainless-steel blade is perfect for cutting breads and roasts, so you can go from the kitchen to the table in seconds. 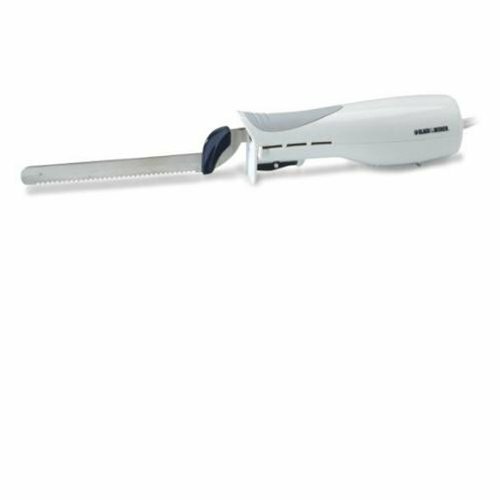 The single blade allows for fast, quick slices and can be removed for easy clean-up, while the carving fork makes holding foods in place a breeze. For those with arthritis, the carving fork makes it less strenuous to hold large loaves of bread and it also helps hold meats while their hot without burning your fingers. Take the blade off and all 3 pieces (base, fork and blade) fit in the carry case, saving space and keeping it protected. A good buy for apartment dwellers or those trying to save money. A knife that allows you to vary speeds is invaluable as it lets you customize your cuts according to what you are eating. Faster speeds for breads and slower, smoother ones for fish or fruits. You want a model that has high-grade or stainless steel, so it won’t rust, bend or tarnish over time. Lesser metals may cut well, but you will need to be more vigilant with their care, which can become a hassle. Plus, if a blade bends, it can pose a safety risk. A storage block or carving fork can be a real bonus, adding another layer of convenience. Some models have a wooden block to hold it when it’s not in use, so you don’t have to keep lying around in a draw. The carving fork is another great extra, allowing for simple serving and holding. I can’t begin to tell you how much of a difference using an electric knife has made. Actually, I can, and I am! Electric knives have 2 blades, with a small motor inside that allows the blades to move back and forth and cut for you. There are 2 styles: cordless and plug-in, which will talk about in more detail a little further on. With an electric knife you can chop and slice in half the time of a traditional one. The motor allows the blades to glide through meats and fruits effortlessly, and no struggling means no wasted time. Need to dice an onion? No problem, and no more crying. The beauty of an electric knife is that it requires no physical strength or motion on your part. You just place it where you want to cut and that’s it. So for those with arthritis, the elderly, or anyone limited arm strength, this means they still have the freedom to cook for themselves. And it also means anyone can carve the turkey! With an electric knife, you can get uniform cuts of vegetables, for even cooking: no more burnt or undercooked pieces. Since the knife cuts for you, you can focus on where to cut, not how. The precision cuts also let you experiment with fancy slices for parties- move over Giada! With a traditional knife, the pressure you use, combined with the back and forth movements, can cause foods to tear and fall apart. An electric knife eliminates that problem. The swift all-in-one motion lets food stay intact, so you can cut delicate fishes or make slivers of radishes neatly. The blades can be removed and washed using soap and water, just like with a traditional knife. Just be sure to dry them completely before using them again. The base, whether it has a cord or not, should be wiped down using a moist cloth, then dried completely; never wet or wipe the plug and keep the motor casing dry. For models with a cord, make sure it is 3 feet or longer so it will not pull or damage the plug. Keep the cord away from water and fire and only use it in a safe, dry, environment. Look for models with an automatic on/off switch, so if it accidentally drops in water it shuts immediately. Try to buy one with added safety features, like a blade cover, or a lock if you have young kids. Let’s compare a standard knife versus an electric one to see which one you’ll get the most use out of. When comparing the 2 it is important to consider convenience: an electric model makes prepping and serving a lot less complicated and increases your food options. Electric knives let you control the size and thickness of your cuts: great if you want to chop up bite-size snacks for little ones that they won’t choke on. It’s also good for grandma, who can still feel useful and prepare meals for herself- or the whole family. Plus, an electric knife offers versatility and some come with add-ons like a carving fork for perfect spiral hams or roasted chicken servings. You can make professional looking party platters. On the down side, you have to be a bit more watchful with these models around kids, as the blades are in motion and they do require a bit more special care than standard knives. For instance, you need to remember to charge cordless varieties. However, these are minor issues that do not take away from the overall advantages. After all, you need to watch kids around knives in either case, so the electric models are still the smarter value. 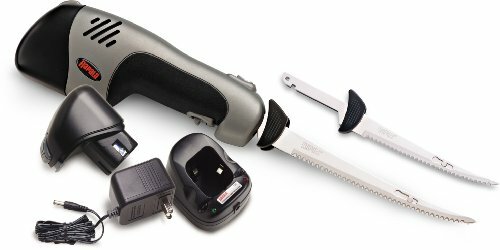 Electric knives come corded, cordless, with a straight blade or with a curved one. The style will determine what you use it for, so this is important The main thing to know is that most cordless models have a curved blade while the corded, or plug-in style has a straight blade. Curved blades are best for slicing fish, fruits, and vegetables; they are not good for slicing whole hams, turkey, or other meats. The curve is best for more intricate slices, which is why it works best on smaller pieces of food. Straight blades are ideal for cutting various meats and loaves of bread. They give you a clean, quick cut that is perfect for these larger pieces of food. 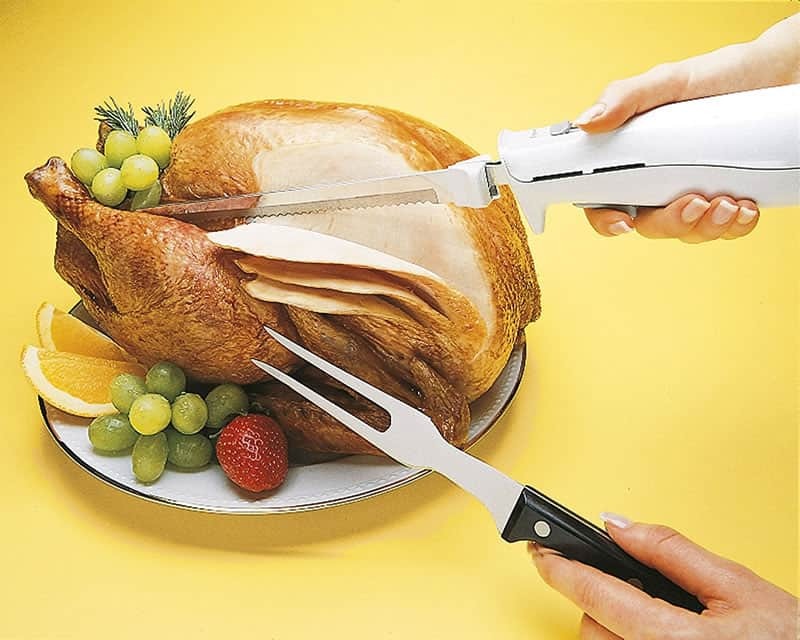 In addition, you can also get an electric carving or bread knife attachment. They both have the same straight blade, the difference being the blades placement inside. With a carving knife the blade sits lower and is usually flush with the handle grip; the tip will point down and it cuts straight through to the bottom. With a bread knife attachment, the blade sits higher, leaving some space at the bottom when you cut; it will not hit the bottom of the cutting board or counter. You can use these 2 knives interchangeably. 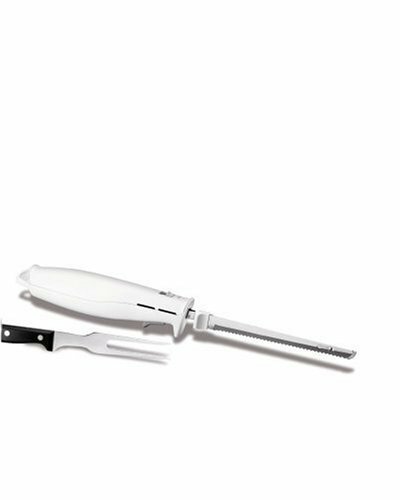 Carving Fork: this extra can help any home cook slice and serve easier. It is perfect for roasts, turkeys and more and makes handling slices so much easier and elegant. Storage Case: if you can get a model with a storage case that’s a big plus; it will protect your blades and also ensure no one, especially kids, get accidentally cut. It also makes it easier to take with you if you are going to a family members or friends house and need to use it. Unique/Removable Blades: some units have interchangeable blades, allowing you to cut meats in hard to reach places or use it on more types of foods. As my Best Electric Knife reviews and buying guide illustrates, an electric knife is a smart investment, offering convenience and precision to make cooking enjoyable. From preparation until serving, these kitchen tools increase what you eat and how, allowing you to dice and chop in varying sizes. Economical and efficient, they speed up cooking time, creating uniform cuts and slivers that are pretty to look at and delicious to eat. Safe to use on breads, meats, fruits, vegetables and more, they can transform any meal into a 5-star meal that is god enough to be featured in a food magazine. Bottom line is, no matter how you “slice” it, an electric knife is a must in your kitchen.